Breeding fish in a captive environment can be difficult but, with the proper information and environment, peacock cichlids can be bred in captivity. Peacock cichlids are a breed of African cichlid native to Lake Malawi. These fish are very colorful and non-aggressive, which makes them excellent fish to keep. 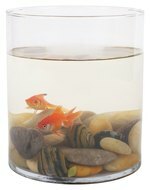 In order to successfully breed peacock cichlids you will need to set up a breeding tank and, once your cichlids spawn, raise the fry in a tank separate from the parents. Set up a breeding tank for your cichlids. The breeding tank should be at least 45 gallons and it should be adequately filtered and heated between 78 and 84 degrees Fahrenheit. Fill the bottom of the breeding tank with sand or fine gravel substrate and decorate it with large rocks and caves. In the wild, male peacock cichlids situate themselves outside of rock caves and grottos in order to attract the female. Introduce your breeding group of peacock cichlids into the breeding tank. For the best results, use a ratio of 1 male to 3-5 females. Watch the male for signs of breeding behavior. The male will dig a shallow ditch in the substrate and begin to make displays to attract a female and to lure her to the place he has chosen for the eggs. Watch as the male courts the female. During the mating process the male and female will make several passes over the selected area and, once the female drops the eggs, the male will fertilize them. After the eggs have been fertilized, the female will gather the eggs into her mouth where they will develop over the next few weeks. Monitor the pregnant female for the next two or three weeks as the eggs develop in her mouth. This time period is referred to as the holding period. During this time the female will eat very little and may avoid opening her mouth at all. Make sure there are plenty of hiding places in your tank so the pregnant female can hide out and remain undisturbed. Carefully transfer the pregnant female into a fry tank just before she releases the fry from her mouth or 2 to 3 weeks into the holding period. The fry tank should be at least 10 gallons in size and equipped with an aquarium heater and a sponge filter. Cover the bottom of the tank with Java moss or leave it bare to make it easier to clean. Allow the female cichlid to remain in the fry tank for two or three days after releasing the fry so she can rest and recuperate before being returned to the main tank. In the wild, peacock cichlids care for their newly hatched fry for a week or so but this behavior is not consistently observed in captivity. Feed the cichlid fry a diet of liquid fry food and newly hatched brine shrimp. You may also supplement this diet with finely crushed flake food. Maintain the fry tank by performing weekly 5 to 10 percent water changes. Keep the temperature in the tank steady and ensure adequate filtration and aeration by keeping your filter clean. Separate the fry into larger rearing tanks once they grow to about an inch in size. By separating the fry, you will be providing them with more room to grow. After four months or so the male cichlids should begin to show their coloring and the fry will be ready to sell or give away.